As a patron of the natur & ëmwelt Foundation Hëllef fir Natur for 10 years, Grand Duke Henri paid a visit and took some time to view the different projects from the Foundation. He walked in the Vallée de l'Our where he also learned more about the Mussel Breeding Station and the Water Discovery Center. 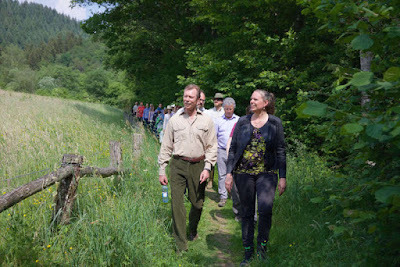 The Minister of the Environment Carole Dieschbourg was also present for the visit. Information from the Cour website, along with a number of other great photos of the visit.